Around 700 scientists from across the country applied for the award. The five-year, $750,000 grant will support Collins and his team of graduate and undergraduate students in their research developing and testing new resonant X-ray scattering techniques that reveal how organic, carbon-based molecules assemble, orient and conform into nanostructures. The information they gather could help improve the design and performance of organic polymers: flexible, stretchable, biocompatible electronic materials that could be used to make everything from printable solar cells to brain implants that restore movement to paralyzed limbs. Organic molecules can be made into inexpensive and conductive plastics called polymers. One reason organic polymers aren’t widely used is because they don’t perform as efficiently as their silicon-based counterparts. In order to make these materials more competitive, scientists need to develop a better understanding of organic polymers’ nanostructures. 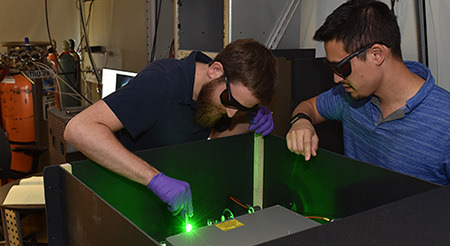 The DOE Early Career Award will enable Collins and members of his WSU research group to investigate how organic molecules assemble into nanostructures using the Advanced Light Source at the Lawrence Berkeley National Laboratory in California. The Advanced Light Source is the only instrument in the world capable of performing the novel X-ray scattering technique Collins uses for his research.